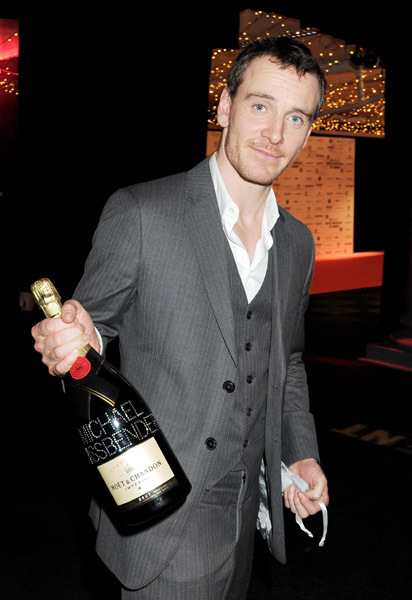 Fassinating Fassbender - A Michael Fassbender Fan Blog: Michael's Fassinating Year 2011: Mainstream Success! Michael's Fassinating Year 2011: Mainstream Success! This is the third year end recap I am doing to highlight the accomplishments of Michael Fassbender as featured here at Fassinating Fassbender. For me, it started off rocky as my work schedule was very different than it is now and more demanding with a lot of driving and crazy work hours, so I was not able to update the blog as frequently as I wanted. I'm still busy as a full-time graduate student and working full-time, but I am at the computer for work and school business more frequently, and consequently, I can be more on top of things. For instance, there were 4 blog entries in January, compared to 27 in September. Then again, as Michael is busier and in the news more, that allows for me to have new information to write about. In reviewing the blog going back to the start of the year, it was wonderful to see the evolution of Michael's career in the span of these 12 months. To think that he is at the cusp of being announced in a month's time as a possible Oscar nominee, is exciting as I have known for several years that he is an Oscar caliber performer. The fan base has exploded for Michael, as tumblr can serve as proof, and he is in high demand by top directors and studios. So let's take a fun look back through this year at some key moments of Michael's rising star year! 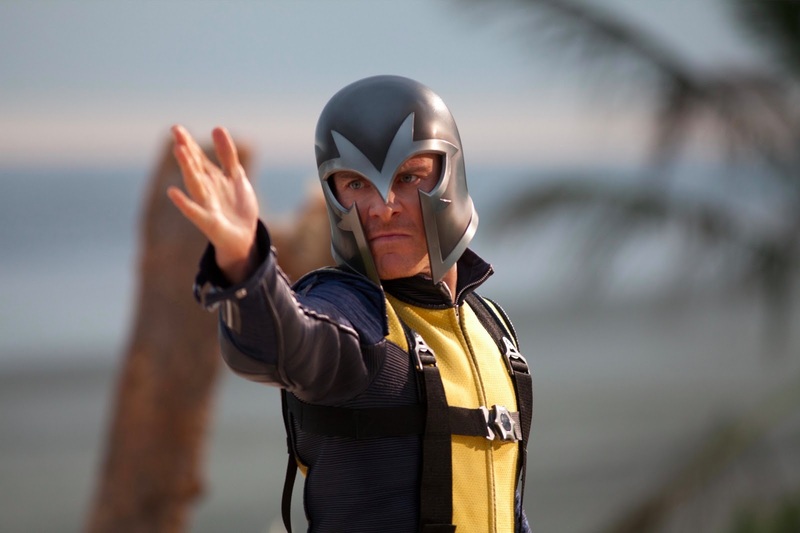 X-Men and Fassbender fans get a first glimpse into X-Men: First Class. Everyone is excited to see how Michael would take over the role of young Magneto. Variety reports that Prometheus is going to start filming in the summer. First images from Jane Eyre are released and we see how handsome the long described unattractive Mr. Rochester is as portrayed by Michael. Vogue US writes a nice article on Michael in the March issue. And we get first peek images of Shame being filmed in New York City! little did they realise, he's been an obsession of many Fassinators for several years already. Doh! An incredible influx of images from Shame while filming in NYC are released, creating great excitement and eagerness to see the film. And switching into a more genteel role, this month, Jane Eyre is released and Michael Fassbender with Mia Wasikowska attend the premiere in New York City. He was still in the middle of a tight and demanding film schedule for Shame, so he could not stay for the after party. Michael and Mia also appeared together on the April issue of W.
Michael turns 34 and he started filming Prometheus. And The New York Times wrote an article on Michael where they cited Fassinating Fassbender's interview with Michael. Excellente! A cool sounding vampire project by Jim Jarmusch is announced which would star Michael along with Mia again, and the incredible Tilda Swinton! 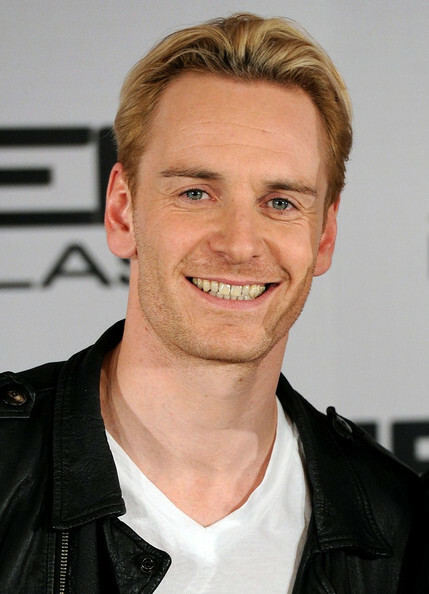 Just weeks away from the X-Men premiere, a blond Michael Fassbender begins promoting the film in London with his co-stars. Needless to say, he was the center of attention with this new look, which is for the Prometheus filming. Later this month, he and several cast members appear on NBC's The Today Show, making that appearance the first on American network television for Michael! X-Men: First Class premieres on June 3rd to much fan fare and it was Number 1 at the US Box office that weekend! The Fassinating Fassbender tumblr is created to primarily host images of Michael, mostly animated gifs that blogger does not support. Tumblr has proven to be useful... at times. This month we also got a first peek at 'A Dangerous Method' trailer. An actress in Shame, Calamity Chang, shares an in-depth first person story on the filming of a pivotal climatic scene in Shame with Michael. She is very complimentary of his professionalism and kindness. Finally, the Haywire trailer and one-sheet are released! Although Michael's role is small, as his profile is rising in Hollywood, his name has been pushed up to second billing amongst a host of well-known co-stars! That's a smart move. The Toronto Int'l Film Festival announces the festival line-up and both 'Method' and 'Shame' will be shown there - just as I had anticipated. Meanwhile, a freshly shaved head Michael attended the Sarajevo Film Festival with director Cary Fukunaga to promote 'Jane Eyre'. After this film festival, Michael, his father, and his best friend start a month long motorcycle road trip through Europe. Much needed time off from months of back to back work and promotions - hopefully he got a lot of rest because starting in September, it is going to be very hectic for him. Michael is spotted in Croatia as he continued on his road trip. Jane Eyre is released on DVD in the States on August 16th. I begin to draft up my TIFF travel and film schedule itinerary. 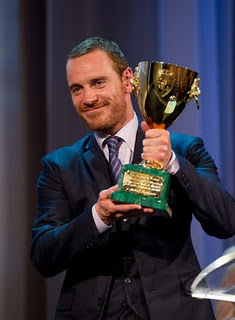 Fassinating Fassbender is three years old this month, and it starts off the month covering the Venice Film Festival. Michael was there to support 'Method' on Sept. 2nd and 'Shame' on Sept. 4. There are tons of red carpet photos from both screenings, but almost immediately after the screening, twitter was abuzz about Michael's performance in Shame. Some even speculated that he could win the Best Actor prize - he was that good in the film. As I head to Toronto for the film festival there, I expected Michael would be preparing to follow suit. However, on that Friday the 9th, I came to learn that Michael had to cancel his Toronto/TIFF plans because 'something' came up. Later we all discovered that he WON the Best Actor prize in Venice, and that is why he was not able to travel to TIFF to be there in time for Saturday night's 'Method' premiere - he was sorely missed. Being the multi-tasking professional that Michael is, he collected his prize and took a first class flight from Venice to Toronto and made it there in time on Sunday, the 11th, to attend the 'Shame' premiere with Steve McQueen. If you need a refresher, read this report. It was a fassinating and surprise filled day let me tell you! I still can't believe my complete luck that day. Later that month, Michael was off to the San Sebastian Film Festival, and now that it's Fall, official Oscar 'Best Actor' talk has begun. A lot of people were so impressed with Michael in Shame, his name was being mentioned steadily. It is not clear where this picture came from or who took it, but we are grateful. This image was posted on the internet in late September and as it is a candid photo taken from someone close in Michael's circle, it shows a side of him that is relaxed and having fun with friends. At this moment, Michael is the talk of the town, and obviously, his friends or slave are just in awe of his awesomeness and just couldn't contain themselves, and had to bow at his bare feet. This position is what many of his fans would love to be in, if just for shits and giggles. I love this photo and it is the Photo of the Year! Update: Read the FF tumblr to learn more about this photo and who is bowing to him! Really? Am I all that? The Shame US release date is announced as December 2nd. And Michael does double duty again for 'Method' and 'Shame' at the New York Film Festival. The next project that Michael and Steve McQueen will work on next summer has been announced as 'Twelve Years a Slave'. Not missing a step, Michael is off to the London Film Festival. Meanwhile, the MPAA slaps the NC17 rating on Shame. Boo! But it was expected. Taking a break from film festivals, Michael attends the grand-opening of the Hackney Picturehouse in his London neighborhood of Hackney. The British Independent Film Awards give Shame seven nominations. Michael heads to Los Angeles for several events and many promotional and PR gigs. First up, Shame is screened at LAFMA, meanwhile, he made a surprise appearance at the AFI festival in support of 'Haywire'. Then a couple nights later, he attended the screening at AFI of 'Shame' to much fanfare again. Meanwhile, at the Seville European Film Festival, Shame won Best Actor for Michael and Best Director for Steve! While still in LA, Michael and Steve attend AMPAS Governors Awards. A nice event to attend to have people who vote for the academy to put Michael's name to his fresh face in their face. American magazines get a clue and start writing feature articles on Michael. He nabbed the December cover of GQ, where he was the belle of the ball at the GQ party, and he was also featured in Time and New York magazines. The December/January theater release dates for Shame was announced. 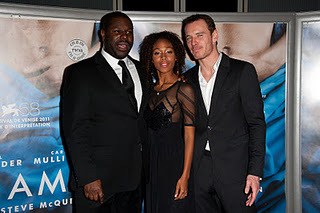 And Shame had a premiere in Paris which included Nicole Beharie along with Michael and Steve. This month is busy as not only does Shame and A Dangerous Method open, but many critics groups are announcing their 'best of' winners. To start it off, well respected film critic, Roger Ebert, gives Shame a rare 4-stars in his review. The National Board of Review gives Michael the Spotlight Award, a consolation prize of sorts in place of Best Actor. However, Michael does go on to win Best Actor at BIFA for Shame. Screeners for Shame are sent out as part of the For Your Consideration campaigns that are in high gear this month - a key moment as the Oscar nominations are just next month! And of the three critics groups that Michael needed to score a Best Actor win in, came from the Los Angeles film Critics Association! Michael needed to win this one in particular as the other two, the NYFCC and NBR went to Pitt and Clooney, respectively. Based on these three critics groups, it's going to be a tight race for the gold. Michael continues to collect accolades as he is nominated by the Broadcast Film Critics Association and the Golden Globes... but amazingly, he was snubbed by SAG. My hometown treated Michael with great respect, the Detroit Film Critics Society named him and Carey Mulligan as Best Actor and Actress! Additionally, the Florida Film Critics and Houston honored Michael with naming him Best Actor as well. Roger Ebert released his top 10 film list, and Shame came in at #2. The London Critics' Circle nominates Michael twice as Best Actor and Best British Actor as well as Shame as British Film. And finally, the long awaited trailer for Prometheus debuts. As you can see, it has been a very busy year for Michael and keeping tabs up on him. It has given me great pleasure to follow his career this year as his mainstream success has opened other people's eyes as to who he is and how talented Michael Fassbender is. I'm confident that 2012 will be yet another milestone year for Michael, especially if he receives that much deserved Oscar nomination for Shame. Once that occurs, a whole new ball game will just begin for him, and we'll be right here along the sidelines cheering him on! Great year in review, Simone! Michael has really had a phenomenal year. I've seen such an influx of new fans, and Michael's mainstream success go sky high! Wonderful review, I can only imagine how wonderful 2012' will be for Fassinators! You write very well about michael. This is a great look back on a great year in the life of a great man. I only hope 2012 will be the same, especially with the almost assured Oscar nomination! That would be a wonderful belated Christmas present! Great post! We are all extremely biased on this site, but doesn't it pay to be Michael Fassbender fan? I mean, long before his breakout year in 2011, fans have been getting brilliant characterizations regardless of the quality of the film, but also through-the-roof intelligence and charisma. And his looks! - let's not be modest here, but no-one else can match those soulful, Irish-eyes and German jaw-line. The man is another Garbo photogenically. Also, I can't think of a film actor from age 20-60 that has Fassy's range. He is the only actor that has made me jump out of seat and thanked the movie gods. Thanks to Simone, I now have a forum where I can share my magnificent obsession. Despite my disdain for acting awards, I'm curious to see what happens in the next few months and the new film projects Michael might be accepting. I want him to be in a romantic or dramatic love story badly!